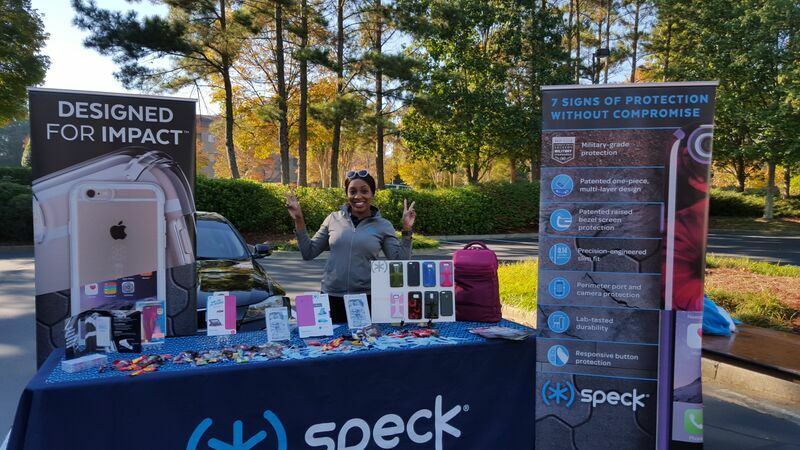 This week Speck was in Alpharetta, Georgia at the Inaugural Verizon Fun Run to cheer on over 1,600 cheerful runners. Attendees enjoyed food, games, door prizes, dance contests, and of course – slim military-grade protective Speck products to keep all of their devices safe and secure. Verizon employees also donated old cell phones, chargers, and other accessories to HopeLine; an organization that provides ways for individuals to take action against domestic violence. Verizon turns these resources into support for domestic violence organizations and programs nationwide. To date, HopeLine has collected over 11.4 million phones and provided nearly $30 million in cash grants to domestic violence organizations. Speck had a great time supporting such an important cause while combining learning, fun, and fitness! Stay tuned to the Speck Buzz Blog to keep up with all of Speck’s events, and find out why Speck cases are Designed for Impact.